Division Two provided the story of the weekend in the South Lincolnshire & Border League as Spalding 3rd captain Carl Andrews hit an unbeaten 156 against Sleaford 3rd before his daughter Macey took five for 30 to help her side to victory. In the Premier Division, Billingborough secured their first win of the season, as did Woodhall Spa 2nd and Grantham 2nd. Billingborough beat Boston 2nd by five wickets while Woodhall and Grantham overcame Stamford Town and Bourne 2nd respectively. Grantham’s was the highest scoring game in the division, Jaden Fell’s 73 helping them to 171 for eight, a total Bourne 2nd were unable to match, being bowled out for 132. Freiston moved into second place with a victory over Welby Cavaliers, Zeeshan Hassan taking six Welby wickets for 12 runs, while Spalding stay top after beating Sleaford 2nd for whom Kurt Colyn hit 53. Heckington moved into third place in Division One, the only one of the top three to play. Baston stay top with Market Deeping 2nd second, just four points separating these teams, though Baston have a game in hand. Heckington beat fourth placed Belton Park who were bowled out for 142. Will Charlesworth then hit an unbeaten 71 as Heckington claimed a six wicket victory. In the only other game in this division, Mitch Griffiths made 51 in Graves Park’s 176 for eight before Moulton Harrox were bowled out for 96. In the Division Two family affair, Carl Andrews 156 helped Spalding 3rd to 240 for nine – the day’s highest team total – before daughter Macey’s five wicket haul helped bowl Sleaford 3rd out for 150. Elsewhere, Uffington were all out for 68, a total Pinchbeck overtook with loss. 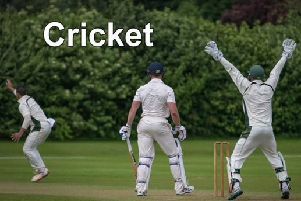 Premier Division: Boston 2 146, Billingborough 147-5; Welby Cavaliers 79 (Hassan 6-12), Freiston 83-2; Grantham 2nd 171-8 (J Fell 73), Bourne 2nd 132; Sleaford 2nd 143-8 (Colyn 53), Spalding 146-5; Stamford Town 114, Woodhall Spa 2nd 115-2. Division One: Belton Park 142, Heckington 143-4 (Charlesworth 71no); Graves Park 176-8 (Griffiths 51), Moulton Harrox 96. Division Two: Spalding 3rd 240-9 (C Andrews 156no), Sleaford 3rd 150 (M. Andrews 5-30); Uffington 68, Pinchbeck 69-0. SLBL Cup: Claypole 222-4 (Lyon 64 King 55), Timberland 162-7 (Plant 63no); Market Deeping 2nd 200 (Bainborough 76, Durham 5-27), Grantham 3rd 107 (N. Andrews 5-22); Skegness 2nd 224-8 (Hughes 113, Brant 58), Spalding 2nd 168-8.